Writing is a complicated process. First your child needs to formulate their ideas, then they need to search for the right words to express these ideas coherently. Next they must think how to spell the words and finally they need to write them down neatly, thinking about punctuation and sentence structure. No wonder some children are not that keen on writing! Developing competence in writing takes time, and takes longer than learning to read. If you want to encourage your child to write more, think of fun writing activities for them to do, such as those shown below or those available in these engaging kids’ workbooks. Writing is fun for a child when it has a purpose, for example to communicate real events which the child has experienced. Focus more on encouraging your child to express themselves effectively - thinking what to write and choosing the best words to write it - rather than worrying so much about handwriting, spelling or grammatical rules. Discuss with your child what they have written so that they come to see writing as a social and enjoyable activity. Reading skills: Your child has to pay attention to how sounds form words and how words make meanings. These are also valuable skills while reading. Also, when reading aloud their own writing, your child learns to speak with more feeling and emphasis. Vocabulary: When writing, your child learns to make more precise word choices which is a much more effective way of learning and reinforcing vocabulary than memorising lists of words. Try giving your child a list of relevant and interesting words, which may be new to them, to use while doing these fun writing activities. When your child uses these words in their writing, it will help reinforce the spelling and meaning of the words. Spelling and grammar skills: Writing helps your child to practice spelling, punctuation and correct verb usage and sentence structure. The more your child writes, the more they will be forced to think about how to spell words correctly and so the better they will spell. Self-expression: Writing forces children to use their own words to express their own thoughts and feelings. Not only does this help them to develop their individuality, it also provides a more constructive medium through which they can communicate strong emotions such as frustration, anger, shame or fear. Thinking skills: As your child's writing skills improve encourage them to start thinking more carefully about what they want to write about and how they should write it. Taking into account their audience's point of view, they need to plan what they write and choose appropriate words in order to get their point across most effectively. In the early stages of writing you should surround your child with writing materials and give them every opportunity to see you write, so that they are motivated to pick up a pencil and try to copy you. As your child's skills progress why not try some of fun writing activities which I have been doing recently with my children. Each activity is described using step-by-step instructions and pictures so is really easy to follow - just click on the links. Use technology cleverly in your creative writing activities to engage but not distract your child. In this activity my son concentrated on adding speech bubbles to photos to tell the story, before tweaking the pictures. Crossword puzzles can be a fun way for your child to develop their vocabulary and spelling skills. 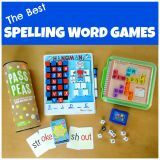 In this activity my children used specially designed puzzles to help practise spelling commonly misspelled words. Try this quick and fun writing activity where your child fills in the gaps to create their very own personalised superhero story. Take one camera and one clipboard and you have yourself a fun letter game to help children practice writing words which start with each letter of the alphabet. For more of a challenge, why not write silly phrases instead. A great way of encouraging reluctant readers to read more is to hand them a joke book. As they laugh they start to associate reading with having fun. Show your child how to make their own joke book in which to record their favourite jokes. This has got to be one of the most fun writing activities we have done. My children love toys and they love making books about toys too! Here they used their love of toy catalogues to help create their very own toy books. Starting out to write a poem can be hard. Help your child to write great summer poems by using these ideas for getting their creative juices flowing. Do you have a child who is mad about Pokemon cards or other trading cards? Encourage them to make their own cards or create a User Guide like my son did here. It kept him busy for hours and was great for improving his spelling. I hope you and your child enjoy these fun writing activities!